I am so behind! I am heading into my exam period so my posts will be less frequent and probably very short. My first exam is on the 5th but I have essays and quizzes to get done before that. I wanted to quickly talk about my experience with the Stay all day lipstick by Stila. My mom got the Stila 500 point kit from Sephora and she doesn't wear red lipsticks so she gave me this in the shade Beso. It's 0.03 fl oz so it is a lot smaller than the full size (0.10 fl oz) and it retails for $29 CAD full size. My experience with it is that it dries very quick to a perfect matte finish. It does not transfer it lasted through me eating and drinking, with minimal fading in the centre of my bottom lip. I really like this product except that the applicator is a little hard to use. I'd suggest maybe using a red lip liner and a lip brush to fill the outside of your lips first because the applicator makes it hard for precision. I had to bring out a ton of q tips and concealer to hide my mistakes from it. Layering of the product is super easy to build up for a deeper tone, but even one layer is super pigmented. It is a bit drying on your lips but relative to other brands I'm extremely happy with it. I use lip balm before I put any form of lipstick on anyways especially now that winter is hitting Canada. 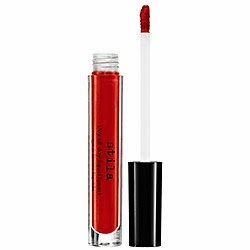 You can always add a gloss or thick balm on top if your lips are dry but this will obviously not last as long on your lips if you do.Beso is a gorgeous "true red" and when it dries to the matte finish it has a really retro vibe which I love! I find it really hard to find true reds, as most of them usually have too much of an orange tone so this was a nice surprise. It is currently sold out on the Canadian Sephora website so it must be super popular! I want to test out other colours because I liked the formulation so well! Have you tried this liquid lipstick before? What are your favourite shades?